You can download this app for free and test it copiously. 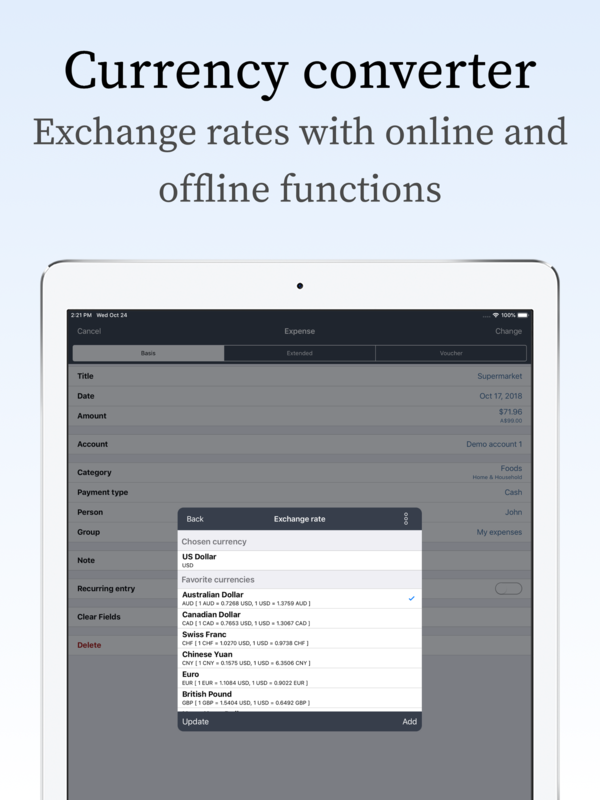 The free version can be used for any length of time and can manage up to 16 monthly transactions. A one-time in-app purchase permanently removes this restriction. Also, there are other extensions that you can purchase. Of course in-app purchases need to be purchased only one and can then be used on ALL your iOS devices (even after a new installation). Incognito mode- to keep prying eyes away when you want to enter transactions in public or retrieve financial status. Creation of transaction documentations that have no influence on the balance. Import of bank statements from a CSV or Excel file (including rule assistant for the automatic setting of transaction criteria). Freely configurable subdivision of transactions based on main and subcategories, payment methods, persons and groups. Then this app is exactly right for you. Test the app and the description. 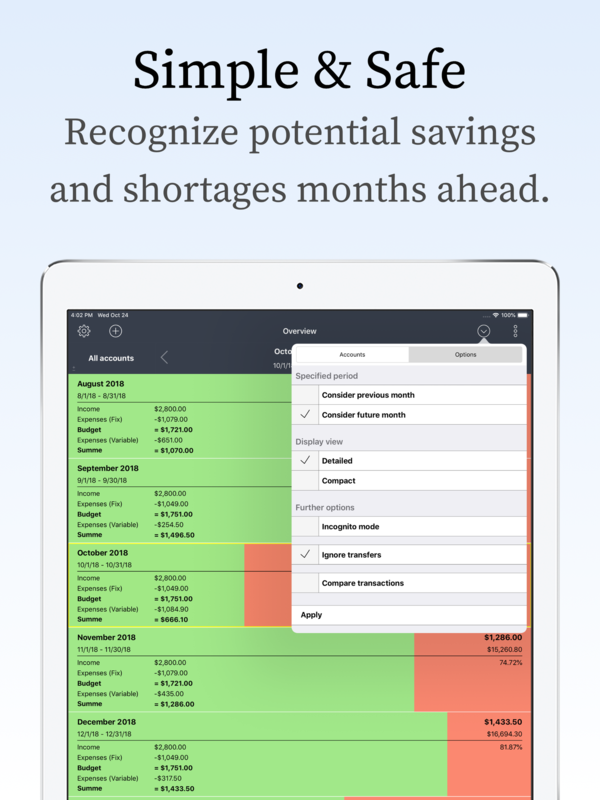 Very few financial apps are as comprehensive and intuitive as ours. Partially, you only need 3 clicks for data insertion. 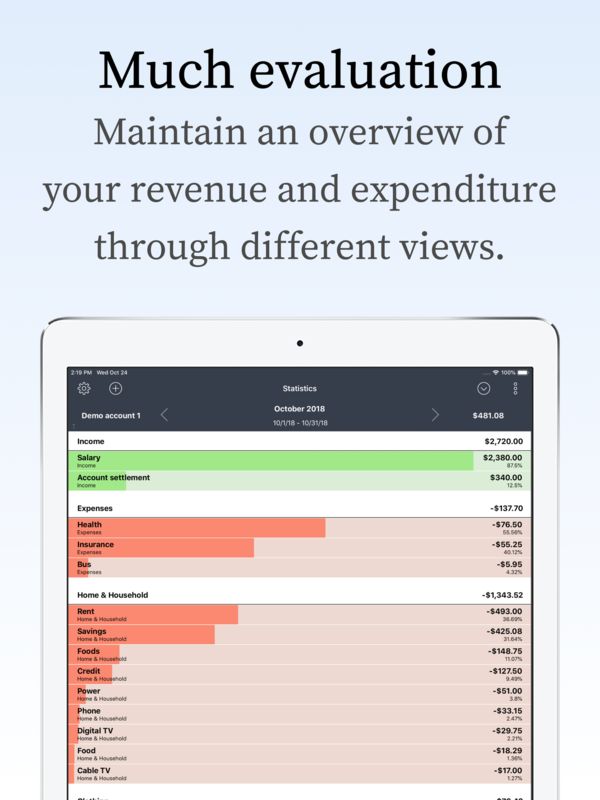 Manage your revenue and expenditure very quickly and conveniently. Manage several accounts and execute transfers between these. Support for recurring entries (weekly, monthly, etc.) and split entries. Use Incognito mode when you want to enter data in public or get financial status. Configure the Start button (menu with 9 commands) according to your choice in order to work even faster with the app. Division of the entries by means of freely configurable main categories and sub-categories, payment types, people and groups. Add vouchers (pictures, receipts, invoices, etc.) to your entries. Reminder function for due payments. 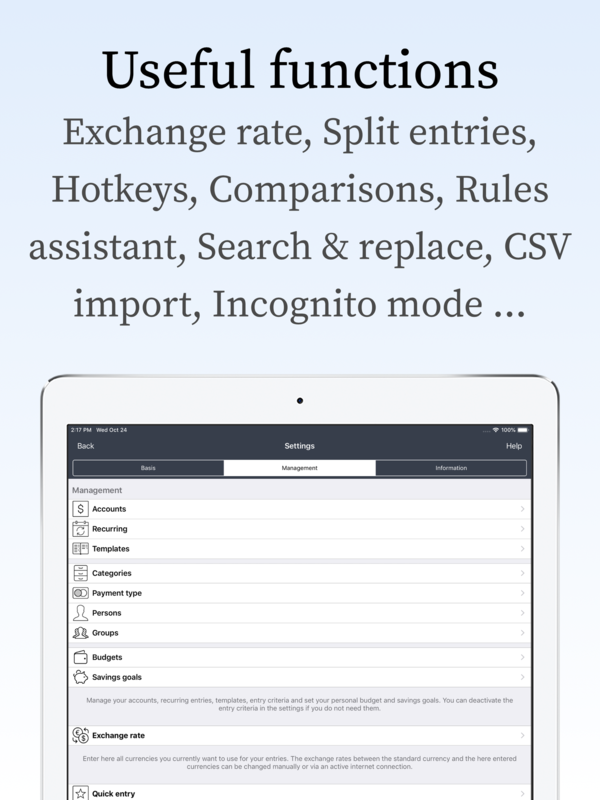 Never miss to pay an invoice again! Mark your entries as having been settled (or offset, paid, etc.). Create documentation entries, which do not have any influence on the balance. Use Quick Actions for a super fast data collection (three-click system). Support for 3D Touch and Today Widget for a more convenient operation. 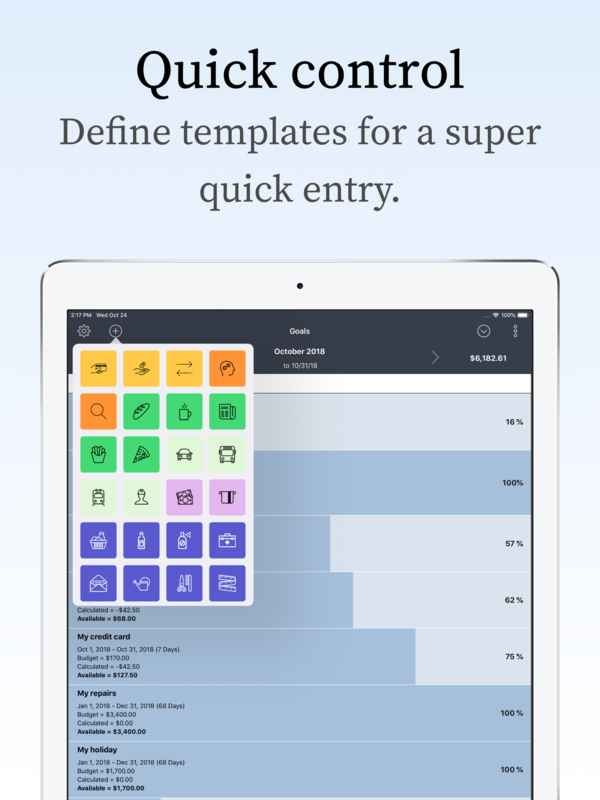 Manage one time or regular goals (budgets, savings goals) - Entries are automatically assigned. There are different views supported (monthly and daily view - including transfer from the following months). Management of freely definable templates for a fast recording of entries. 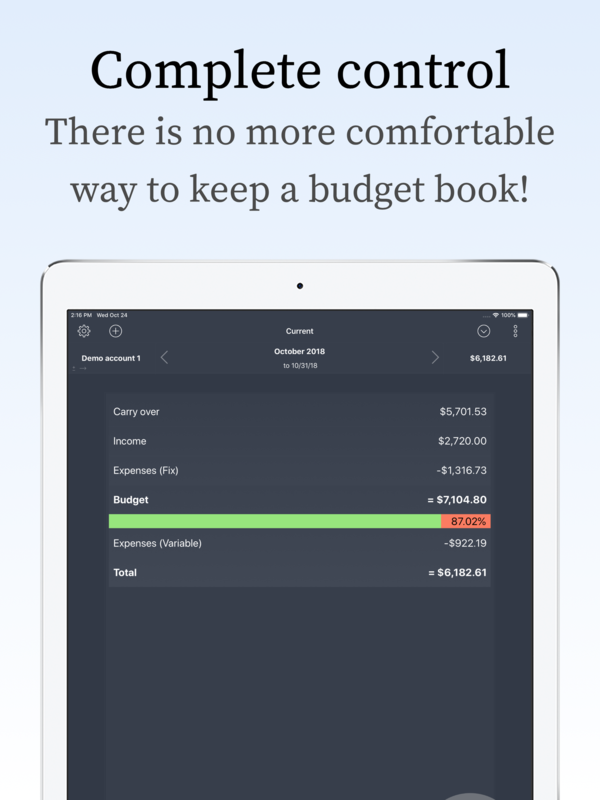 Extensive configuration options - Create your personal Budget Book. Preview of the following months – Recognize potential savings and shortages months ahead. Very convenient and powerful search function (including Search & Replace). 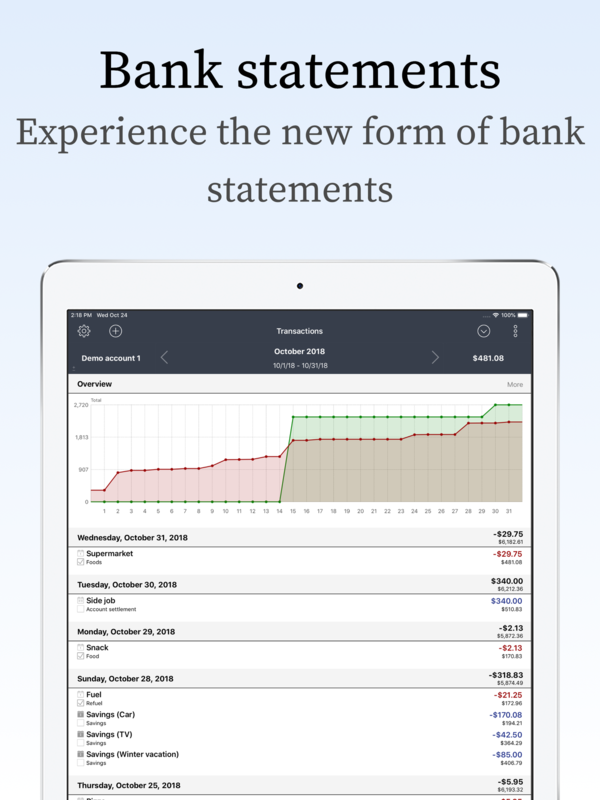 Versatile account statements and evaluations - Find out where your money has gone. 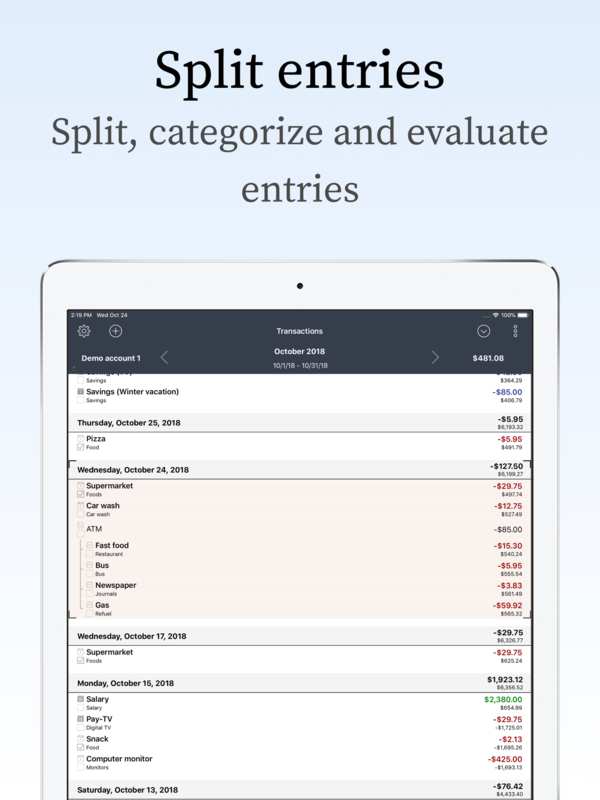 Keep track of your incomes and expenses outline through informative statistics, comparisons, charts and predictions. Print all data (using AirPrint) directly from the app. Export of the data for its post-processing in Microsoft Excel, Apple Numbers, etc. Create, print and send PDF / HTML reports. Import of your account statements from a CSV or an Excel file. 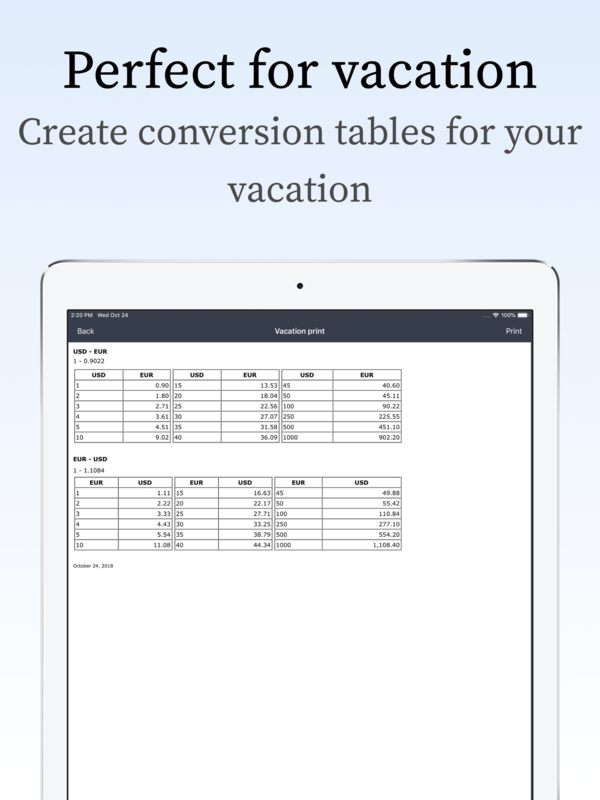 Easy-to-use currency converter (including online update and supporting 170 world currencies) including vacation print. Secure your encrypted data in the iCloud. Protect your data using a code and your fingerprint (requires Touch-ID/Face-ID) - including an entering delay. Change the system language within the app. Use the rules assistant to automatically include booking criteria in your imported booking entries. The correction assistant offers you the opportunity to send us detailed information and conduct data manipulation in case there are any problems occurring with the app. We include an extensive manual in German and English. This is only a small outline of what the app has to offer. 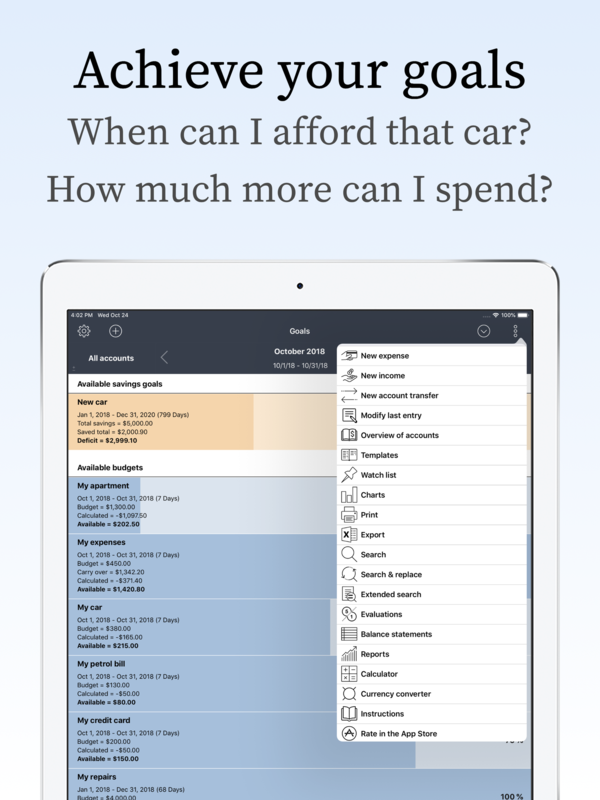 Convince yourself and download the free version.